The latest WannaCry ransomware outbreak raised a lot of eyebrows as it wreaked havoc around the world, causing the shutdown of some hospitals in the U.K. and several large companies to suspend operations for 24 hours or longer. never be able to access them again. It’s no secret we’re big fans of Emsisoft. We’re fans of their products, we’re proud of their excellent team, the support they provide our mutual customers, and we’re proud to be an official Emsisoft reseller. So, we are very happy to report that all Emsisoft users will benefit from a new Emsisoft feature called Anti-Ransomware. “We at Emsisoft see it as our responsibility to keep you safe from all kinds of ransomware, and we are confident that we can stay technological leaders in the fight against malware that encrypts your personal files. To emphasize our products’ strength in this regard, we decided to shift our existing and proven anti-ransomware capabilities into a separate protection layer component that we are calling ‘Anti-Ransomware’. New main guard component “Anti-Ransomware” to emphasize the trusted ransomware protection abilities that were previously part of the Behavior Blocker component. * New scan setting “Scan in email data files” that allows you to include or to skip the scan of potentially large email files. Lowered the number of false positive alerts. Emsisoft is set up to update automatically (it’s set up this way by default), then you get the newest Emsisoft update automatically. If you’re not using Emsisoft, now is the time to make the switch.We’ll even install it free and you’ll get our Cloudeight discount. 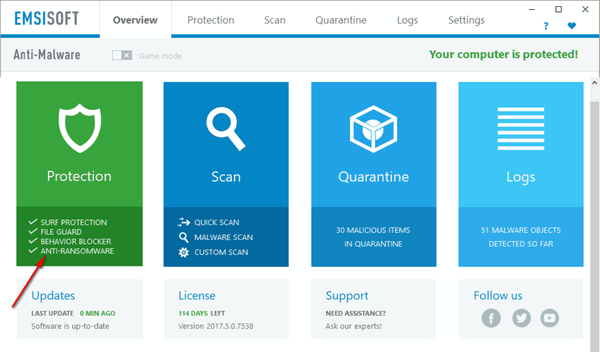 Visit this page to get Emsisoft Anti-Malware with Anti-Virus and Anti-Ransomware, a one-year license, PLUS FREE installation and set-up by Cloudeight Direct. We know you’ll be glad you did. Learn more here. That’s great! This will be my 3rd year using Emsisoft and I plan to continue. Whenever I have had a problem or question they immediately contact me and solve it! Where can you get customer service like this today..??? I agree with Yvonne Jackson – although I think it is longer than three years that I have been with Emsisoft.